Conventional air traffic management (ATM) practices are known to be too rigid to accomodate for the projected increase in air traffic over the next few decades. To address this issue, the FAA’s NextGen iniative aims to introduce a set of technologies that will modernize the national airspace in the upcoming decade. 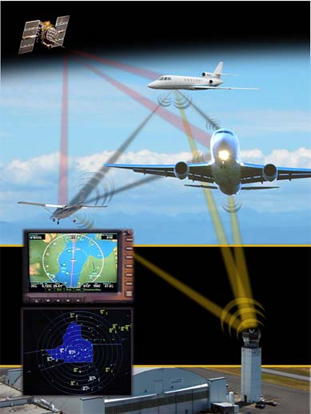 In particular, the Automatic Dependent Surveillance Broadcast (ADS-B) information exchange protocol relays highly accurate air traffic information between equipped aircraft and a network of satellites and ground stations. 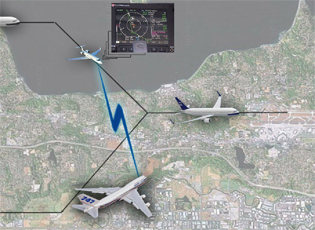 At the GRITS Lab, we are developing distributed negotiation algorithms which make use of the inter-aircraft communication capabilities provided by the ADS-B protocol in order to safely and efficiently merge aircraft during the terminal approach. In particular, conflicting aircraft negotiate for both a time and order of arrival at a merge point which minimizes a pairwise cost that penalizes changes in velocity, deviations from the nominal trajectory, and changes in the estimated time of arrival (ETA) for each aircraft. Moreover, a set of feasible conditions based on the aircraft characteristics and the geometry of the merging fork are given to identify when the algorithm is guaranteed to merge aircraft safely. R. Chipalkatty, P. Twu, A. Rahmani, and M. Egerstedt. Distributed Scheduling for Air Traffic Throughput Maximization During the Terminal Phase of Flight. 49th IEEE Conference on Decision and Control. Atlanta, GA, Dec. 2010. R. Chipalkatty, P. Twu, A. Rahmani, and M. Egerstedt. Distributed Scheduling for Heterogeneous Air Traffic Merging and Spacing During the Terminal Phase of Flight. Submitted to AIAA Journal of Guidance, Navigation, and Dynamics. Submitted Feb. 2011.